WHATS YOUR VISION FOR FITNESS? "At 70 years of age and grossly overweight, I felt that I had left it too late to do anything about it. I was 18 stone 4 and only 5ft 8” tall - so officially obese!! UrvisionPT convinced me that it wasn’t too late and promised to not only get my weight down but also to firm up the flab and get me fitter. Now I’m not giving him all the credit because they can only advise and demonstrate. It does need a strong motivation and dedication to the program for it to work. But UrvisionPT has worked with me providing me with the motivation and advising on nutrition/diet as well as designing a gym workout that is demanding yet enjoyable. The gym need not be boring. UrvisionPT has ensured that exercises are within my ability but still stretch me. Booking UrvisionPT as my personal trainer has been key to my success. I am now down to 14st 3lbs and feeling so much fitter. It’s taken years off me. "Once I had stripped the fat of my body, which I had wanted to get rid of for a long time, I wanted to then gain some size to me. So I went to UrvisionPT and since then I've progressed massively considering I was struggling on light weights, and now I am lifting more than I could imagine and I have only been building for just over 5 months. I started at 11.7 stone and now weigh in at 12.8 stone, so i have gained just over a stone of lean muscle The difference I can see in my own body is massive, and I am very happy with the results. I cannot recommend Adam and his incredibly effective way of working, highly enough. I enjoyed my sessions enormously and they were tailored to suit me, my strengths and my goals. And the knowledge I have gained about fitness and technique has been invaluable! Can't say enough positive things! Lost a stone, increased my strength - and fitness levels have never been better. A thousand Thank you's!!! Fran completing the London marathon after training with UrvisionPT. David after losing 4 stone 1 pound at 70 years of age with UrvisionPT. 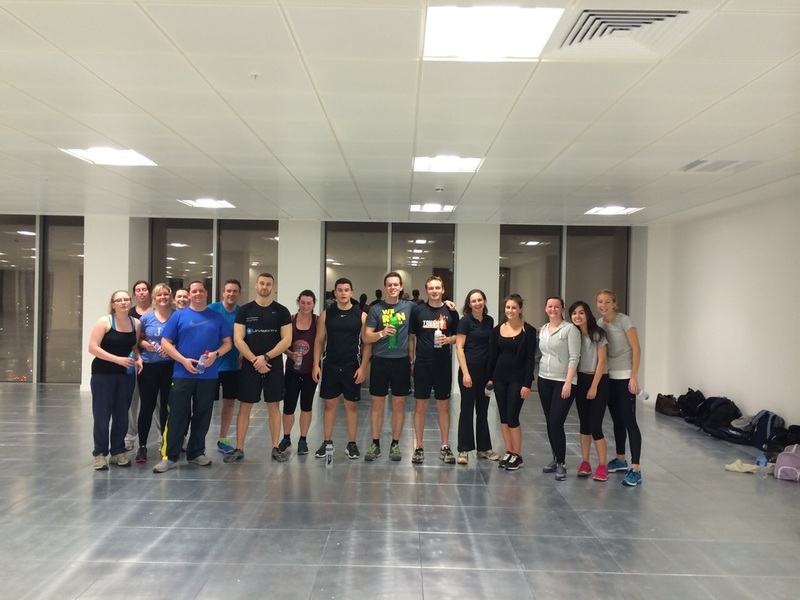 KPMG Corporate fitness class in Manchester.